Recently I played a couple of games of The City. It’s a small card game for 2-5 players designed by Thomas Lehmann. Well known for To Court the King and Race for the Galaxy. In this card game players build a city by placing building cards in front of them. The first player to reach 50 points wins this quick game. 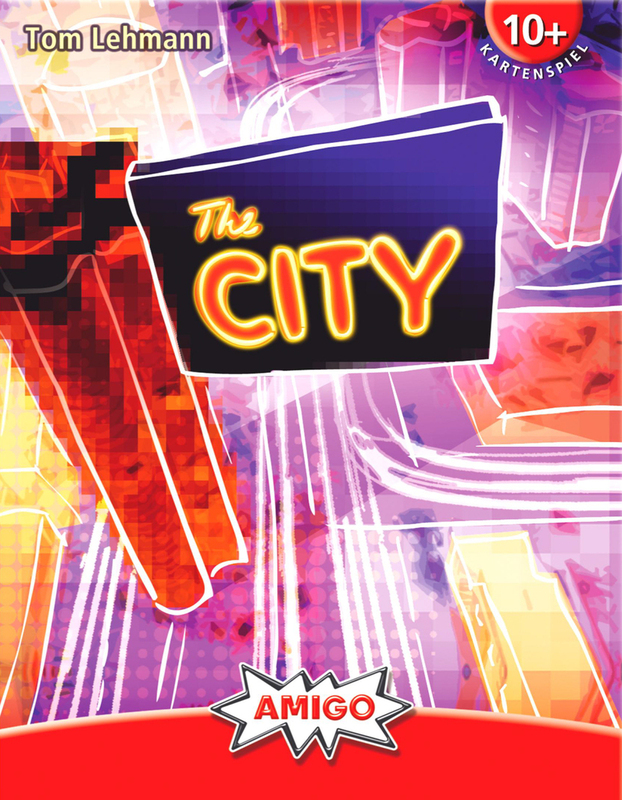 In the City players build a city using cards which represent different kind of buildings or other infrastructure. Setup requires players to shuffle a deck of cards and drawing 7 cards and discard 2 of them so players start with 5 cards in hand. First players select a card from hand to build in the build phase by placing it face down on the table and them revealing it simultaneous. Players pay for buildings and other real estate by discarding cards from hand, then they collect income by drawing cards from the draw deck for each income icon on all their building cards that have been build. Income is drawing cards from the draw deck. In a similar way players do the same for victory points icons which are also in each build card. Victory points will have to be noted on a piece of paper. The game is over quickly because after each build phase victory points are collected. Quite a few building have extra game text and can interact with each other. I found this game to be a skinned down version of Race for the Galaxy and San Juan. Some combo’s were potent but getting certain cards together in play seemed too much dependent on luck and there is just not enough time to strategize. Some buildings have symbols on them which will interact with other cards. A card might give income or victory points depending on the amount of shopping chart symbols on all your build cards. Or reduce the amount of cards you need to pay for a certain card by X where is X is the amount of car symbols. Some cards can generate more than 8 VP each turn. This means the game is over after a few more turns. Interaction is non-existent, so there is no way to get rid of your opponents powerful buildings to catch-up when you’re behind. This small game not difficult at all. If you are looking for a small SimCity game to bring along in your backpack that everyone can play this is well suited. Gamers and people who look for a bit more strategy and depth should look elsewhere.